Several years ago when I was first coming up with some quilled jewelry designs I was picturing a certain design in my mind. I made the pieces and then found out that they did NOT work together as I wanted them to for a particular design. But I had these pieces and didn’t want to put them to waste. So I thought of a couple more ways to use them, showed the ideas to my then 4 year old daughter, and she chose this design. Since then I have made this design in soooo many colors! And today I’m going to teach you how I make it so you can make your own! Gather your supplies. You will need three tools/items to wind the papers around that are of different sizes. I use the end of an aluminum handle quilling tool , the end of a pen, and the top of another pen. To wind the paper around, bend the end around your tool and put a tiny dab of glue on the end. Using your finger to keep the end tightly tucked underneath, start rolling the paper around the tool. When you get to the end, add another dab of glue and press it closed. Hold it for several seconds to make sure it is holding tight before you let it go. I am using glistening papers here and they have a smooth surface. 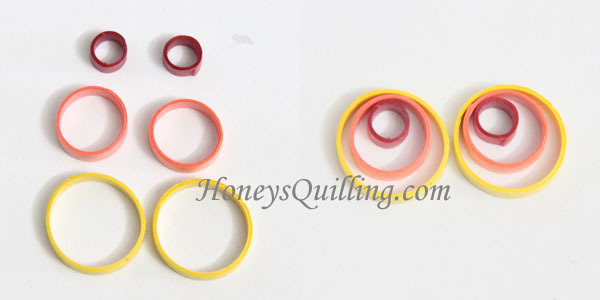 When you use these types of papers you will need to hold it in place a bit longer than you would if you were using regular quilling paper. Once it is held fast, hold it firmly yet gently and turn it slightly while you pull it off of the tool. If you just pull straight off and if you are holding too tightly you might squish it when it comes off the tool. Repeat with the medium and large circles on your other tools/objects. I find it easier to do the twist off for the small and medium sizes. For the larger size I find it more reliable to take it off gently by using my fingers as shown in the third photo below. Go around the circle moving it up bit by bit until it pops off. If you have a very smooth object you may be able to do the twist off for this size as well, maybe my pen is just not slippery enough! Just be very careful not to squish it as it is coming off. Now you should have six pieces as shown below. They will be arranged as shown on the right, but they will not be glued together! Of course you can glue them together if you wish to, but I prefer not to so they are more dangly and free. Now it’s time to add sealant! You can skip this step if you wish. It will make your quilled jewelry more sturdy and water resistant. Here I am using a liquid sealer . You can use a thicker sealant which you paint on, but for this type of shape I find it easiest to just use a liquid sealant to make sure all areas are covered. Use your tweezers to pick up a piece and dip it into the sealant until it is submerged. Pick it back up and set it on the tissue to soak up any excess sealant. Do not let the shape sit in the sealant for more than a few seconds. If it does it can soften too much and become misshapen. Let the shape sit on a tissue for no more than a minute (even a few seconds will be long enough) or else it might start to dry and stick to the tissue. Pick the shape up with the tweezers again and place on a plastic surface to dry. Let dry for at least several hours before assembling. To assembly, use a large jump ring to put all three circles on. Place an earwire onto the jumpring as well. you are finished! You can make these in all different sizes. Keep in mind that the larger your circle, the longer your paper will have to be. Check out the advice in this post about the thickness of your pieces for jewelry. I just found your site and love it. Your designs are so much fun. And thanks for the tutes on sealing the quilling. What sealant available in the USA that is the closest to the liquid matte sealant? Thanks, Bobbie 🙂 I am in the process of trying some new products, and I hope to be able to find something close to the liquid matte sealant in the US. As I am not in the US right now I can only order things online, so it’s hard to see what might be close. So far I haven’t found anything quite like it. But if you go to a big craft store, have a look around. Go to the sealants/glazes/topcoats and shake the bottles. If it sounds liquid, it should work similarly. ur design are simply superb!!! what to clear something. what is the liquid sealant. where can i get this in dubai/India?. what is the size of the large jumpring used? can you make a peace sign earring please? By the way you are awesome at this stuff! sounds like a fun idea, I’m adding it to my list! A simple yet lovely design. These stuffs are easy to make for learners like me. I have a doubt! Is there any way to hold the circle in shape? Since its paper, any rough handling can change the shape of the circles na?